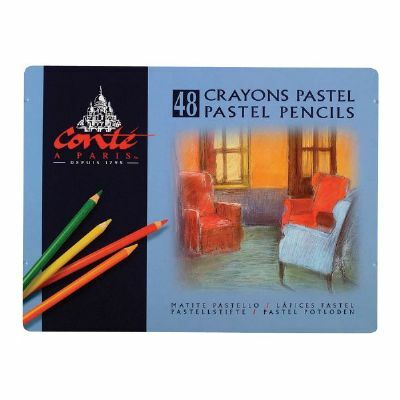 Conté™ Pastel Pencil 48-Color Set. The best pastel pencil for blending. Each pencil contains extremely high pigment content for lightfastness. Lead diameter is 5mm and is larger than most other pastel pencils. Excellent for detail in small and medium size formats. Packaged in metal tins. Set includes 48 pencils: Bistre, Dark Green, Red, Yellow Violet, Blue, Red Brown, Light Green, Black, Ultramarine, Pink, Orange, White, Golden Yellow, Olive Green, Yellow Ochre, Natural Sienna, Purple, Light Grey, Green Blue, Prussian Blue, Lemon Yellow, Lilac, Scarlet, Light Blue, Mineral Green, Red Earth, Umber, Dark Grey, Viridian Green, Indian Yellow, Madder, Garnet Red, Red Lead, Cyclamen, Sepia Grey, Prussian Green, Saint-Michel Green, Dark Ultramarine, Naples Yellow, Flesh, Light Orange, Lime, Grey Green, Payne's Grey, Natural Umber, Persian Violet, Sky Blue.